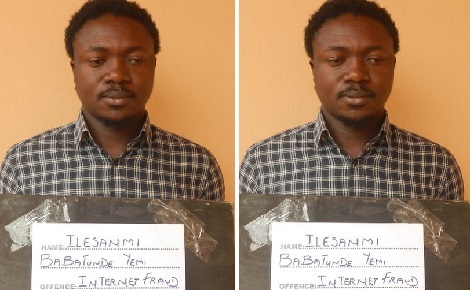 The Ibadan Zonal Office of the Economic and Financial Crimes Commission (EFCC), has arrested a suspected undergraduate internet scammer, Ilesanmi Babatunde Yemi for alleged Internet fraud. The 31-year-old final year Accounting student of Ekiti State University, who poses on the internet as an American Army Officer by the name Dennis Martinez allegedly serving in Libya engages in Internet love and romance scams. He engages unsuspecting ladies on the internet in a dating and romance scam through which he fleeces them of their money. Last of his victims were the duo of Sandra Simundza and Lily F, both in Australia, from whom he claimed to have obtained about Five hundred dollars in tranches. Babatunde, according to series of intelligence gathered by the Commission, allegedly lives an ostentatious life without a definite job. He confessed to have been engaged actively in internet romance scam in the last four years from which he sustained his flamboyant lifestyle and bought himself a 2005 Lexus car with registration number Lagos MUS 404 DX. Being a Part time student, he also confessed to have spent most of his time on the dating sites, particularly tinder and okculpid from which he meets his victims. Operatives have recovered several items from him. They include: One laptop Apple macbook Pro, three ATM cards, one iphone 6 x plus, one Nokia phone and one international Passport. Several love scam mails were also found and downloaded from his laptops. The suspect will be arraigned in court soon.